Current state of my Kanagawa Garden. I've not posted much about this, but I have a garden. While not quite as dramatic a story as my Tokyo garden, it is just as wonderful. Friends I'd made in a nearby community garden suggested I see about renting a spot. We talked to the manager, and he said some were available. My friends helped me choose one. This was in winter. "You can't plant anything now," said the manager. I said I would just do some planning. Then one by one other members of the plot came over to say hello. They, of course, brought with them seedlings from their own gardens. Within the span of two hours I went from no garden to a garden with a handful of plants (lettuce, broccoli, cabbage, onions, and strawberries) and mulch. Since then I have puttered and potted up seeds, fretted and fertilized with well-composted manure, gathered leaves and grass clippings for mulch. I have a garden journal with a tidy diagram of what I plan to do and on another page is a messy diagram of what actually happened. Seedlings fill the living room, the garden itself, and I'm already planning to order more. I am pathetically happy. What has been added since that time are potatoes (on the right under netting to help hold the leaf mulch in place), peas to the right of the potatoes, and tulips in the front left by the previous owner. 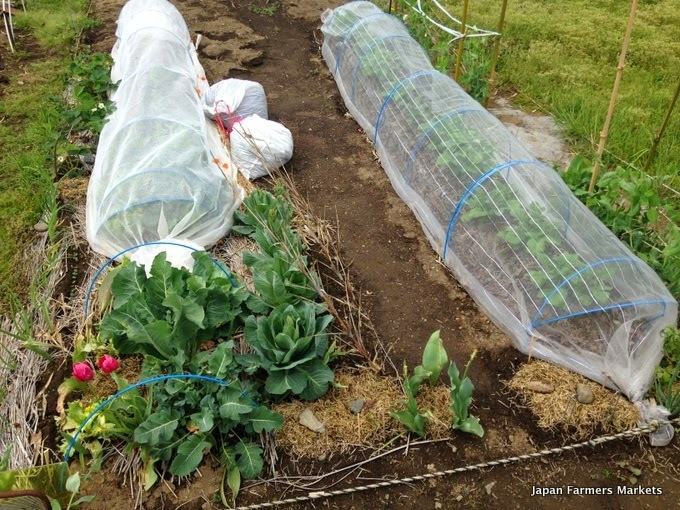 Under the netting on the left are a few cabbage and broccoli as well as karashina, swiss chard, kale, and beets. The strawberries are in the back of the photo on the right side of the netting. Cilantro is there, too, as are alyssum and a sprinkling of radishes here and there. Further back is where the tomatoes and popcorn will go along with the squash and watermelon. The two white garbage bags hold my assorted bits of mulch. I repeat: I am pathetically happy.